Update, May 15: Pyke’s abilities have been revealed. Here are the best League of Legends champions for beginners. When Pyke is unseen by enemies (either by walking into a bush or the Fog of War) he rapidly regenerates some of the health recently lost to enemy champions. It’s a format similar to Tahm Kench’s Gray Health, but fits more closely with Pyke’s edgy aesthetic. Pyke also converts any bonus health into bonus attack damage. Hold: Pyke readies and then throws his harpoon, impaling the first enemy struck and pulling them a fixed distance towards him. This means that if you’re close to the enemy you hit, you can very easily swap places with them, so be careful not to throw yourself into their team. Pyke dives into spectral waters, entering camoflague (remaining hidden from view while enemies remain outside his immediate area). He also gets a significant increase to his movement speed that decays over a few seconds. Pyke dashes, leaving behind a drowned phantom. After a delay, the phantom returns to Pyke, damaging and stunning enemies it passes through, making it a handy engage tool, but also useful for a getaway. Pyke strikes in an X-shaped area, blinking to champions and executing those below a certain flat amount of health. Enemies in the X that aren’t executed take damage equal to that amount. If a champion dies in the X, Pyke can instantly use Death from Below again for a short period of time, much like Darius’ Noxian Guillotine. Also, if Pyke kills an enemy champion with his ultimate, the last ally to assist also gains full gold (but not kill credit) which is how this new support can get away with an assassin’s ultimate. It should make him a powerful revenue-sharing tool in the bot lane. You can see how all of Pyke’s abilities chain together in the video below. Expect to see him emerge from the depths in patch 8.11. Original story, May 11:League of Legends’ deeper, darker new supporthas been revealed. 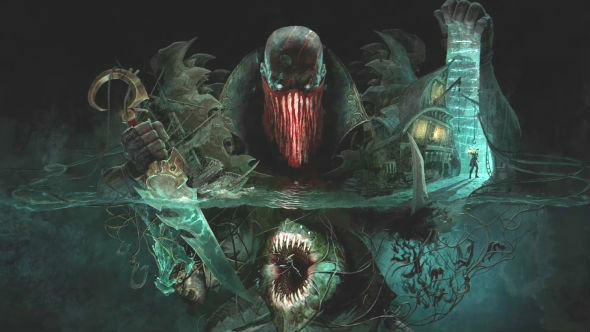 Pyke, the Bloodharbor Ripper is the game’s latest new champion, a tortured soul who walks the streets of Bilgewater seeking revenge against his former shipmates. The teaser doesn’t show off much about Pyke other than his lore. It’s quite similar to Nautilus’ – the ghost of a man abandoned by his crew and seeking revenge against those who betrayed him…from beyond his watery grave. From what I can see from the champion teaser, which you can watch at the top of this article, that seems a bit unfair – Pyke does appear to launch himself into the gaping maw of some unspeakable ocean leviathan of his own free will, but I’m sure he has good reasons for his vendetta. In terms of abilities, there’s not much to go on, but I’ll take a guess from what’s in the teaser. I reckon his knife will be a small skillshot, which will do increased damage if he’s able to root his targets – the video implies him cutting the throat of a man he’s ensnared and trapped beneath the waves. Sadly, the arrival of Pyke does seem to put paid to fan theories that the new champion would be an enormous mechanical manta ray, which would have been cool. There’s no official release date on Pyke yet, but expect to see him turn up in either patch 8.11 or 8.12.